- Orders must be placed by what's app or sms to 96610625, Monday to Sunday from 11am-10pm base on availability slot. 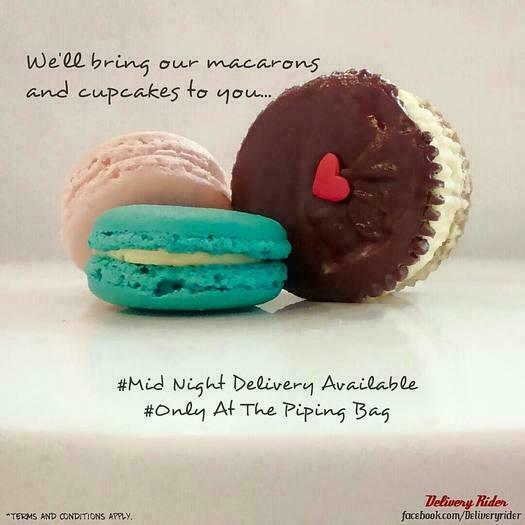 - A delivery surcharge of $8 per location applies only for cupcakes and macarons purchase. - Delivery not applicable to Sentosa, Jurong Island, restricted airline and cargo area as well as other locations not in mainland of Singapore. - Any amendment to orders or delivery date will be base on availability and there is an administrative charge of $5. - Mid Night Delivery 11pm-1am, additional charges of $8 per location. - The Piping Bag (Private Limited) and Delivery Rider is not responsible for undelivered products due to the absence of the recipient or wrong address given. - Payment must be made by bank transfer to The Piping Bag (Private Limited). Orders will be confirm by what's app or sms once payment received. - Strictly no refund on cancellation of orders. - As a goodwill gesture, the undelivered products will be sent to The Piping Bag outlet for self-collection. After 48hours, we are not liable for items that have not been collected. CONTACT US FOR ENQUIRIES OR TO PLACE AN ORDER NOW!